The staff visits Cayo Santiago to assess the damage after the storm. Photo Credit: Bonn Aure, Caribbean Primate Research Center. ANN ARBOR—It was days after Hurricane Maria punished Puerto Rico as a Category 4 storm, leaving the whole island without power or water, that University of Michigan researcher Alexandra Rosati finally received good news: 00O had survived the storm. 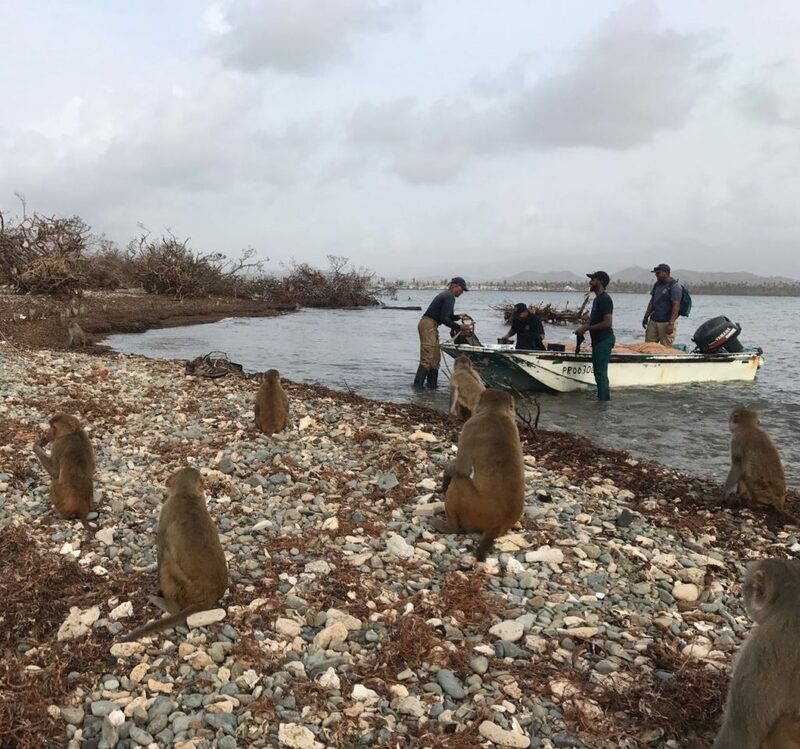 It had been a heartbreaking week for the researchers as they tried to find out the fate of Cayo Santiago, a small island off the coast of Puerto Rico that has been home to rhesus monkeys since researchers introduced the primates there during World War II. Since then, researchers have analyzed generations of monkeys, each identified by a three-digit code, to figure out how they solve problems, interact with each other and choose mates, and to study the genetic underpinnings of their complex social behaviors. Since the hurricane hit Sept. 20, Rosati and researchers from a half dozen universities have focused on saving what they can of one of the oldest research fields in the world. The first images captured by a helicopter weren’t promising. The forest, once green and luscious, was now brown. The labs and research infrastructure at Cayo Santiago Research Station was torn to pieces and Punta Santiago, where the staff lives, had been destroyed. On the street, an ominous message written in chalk: SOS Necesitamos comida/agua. We need food and water. Once people were able to reach the island researchers found out the animals had braved the storm, but the island vegetation has been decimated, and the infrastructure providing life-sustaining freshwater has been destroyed. “We need to act quickly to save these monkeys,” said Rosati, an assistant professor of psychology at U-M who first worked at Cayo Santiago 15 years ago as an undergraduate. University of Michigan students, staff and faculty are also organizing to provide relief assistance to those on Puerto Rico’s main island. “Cayo is a unique place where we can see the workings of primate society up close, and many scientists have gotten their first real taste for research on this island,” she said, adding that research on the island provides a livelihood for many in Punta Santiago. Researchers and staff have immediate plans to send food and supply fresh water for animals. During the day, the staff is already making boat trips to the island to deliver supplies and rebuild freshwater cisterns that were damaged in the storm. At night, they work on rebuilding their own communities. Scientists are also organizing to ship crucial supplies to both the monkeys and the staff living in the local town. In addition to U-M, scholars working to raise funds and organize relief efforts for the monkeys and the people in the surrounding local communities are from New York University, University of Washington, University of Buffalo, University of Exeter, University of Pennsylvania, University of Puerto Rico and Yale University. Two GoFundMe sites have been set up to help with the efforts, one focusing on the research and one on the community—Cayo Santiago Monkeys: Maria Relief and Relief for Cayo Santiago Employees—have been set up to support the relief effort.